For ballet dancers everywhere, winter isn’t the holiday season; it’s Nutcracker season. But here in San Luis Obispo there are holiday themed ballet performances galore! In addition to the classic standby, The Nutcracker, patrons of the arts can also catch toe-twirling renditions of Babes in Toyland and La Boutique Fantasque. NUTS FOR NUTCRACKER: In Civic Ballet’s retelling of the holiday classic The Nutcracker, Clara’s nutcracker prince comes to life and takes her on adventures in his magical kingdom. While ballet companies across the globe may be accused of overdoing The Nutcracker every December, Drew Silvaggio, artistic director of Civic Ballet in San Luis Obispo, never gives his dancers the same steps for their annual production of the holiday classic. “We re-choreograph The Nutcracker every year and that makes it fun for me, as the director, but also for the audience,” Silvaggio said. This year marks the 38th year that Civic Ballet brings The Nutcracker to the stage, and this year, about 150 dancers will pirouette and leap to the live music of the San Luis Obispo Symphony as Clara and her nutcracker prince gallivant through his magical kingdom. “Many families tell us, ‘It’s not the holidays until we’ve been to The Nutcracker,’” Silvaggio said. 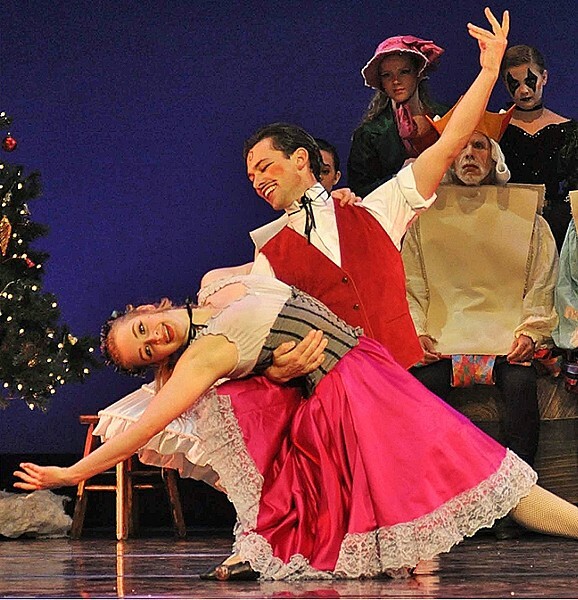 The Nutcracker is showing Dec. 11, 12, and 13 at the Cal Poly Performing Arts Center. S.O.T. (SAVE OUR TOYS): Coastal Chamber Youth’s Ballet’s performance of Babes in Toyland tells the story of sibling duo Tom and Mary, who must fight to save toys and holidays from the evil villain Barnaby. Adapted from the book and movie of the same name, Coastal Chamber Youth Ballet’s production of Babes in Toyland tells the story of sibling duo Tom and Mary, who must fight to save toys and holidays from the evil villain Barnaby. Nursery rhyme favorites such as Little Bo Peep and her sheep and Mother Goose also make appearances. While this is the eighth year that the company has performed Babes in Toyland, each year new characters and plotlines are introduced. “It’s really a sweet, delightful ballet,” Molly McKiernan, artistic director for the Grover Beach-based Coastal Chamber Youth Ballet, said. “We wanted to bring something to the community that was new and different. Babes in Toyland is showing Dec. 4, 5, and 6 at the Clark Center for the Performing Arts in Arroyo Grande. THE TOYS WILL TALK: Attendees of Ballet Theatre San Luis Obispo’s La Boutique Fantasque (The Magic Toy Shop) will also be treated to a performance of Les Patineurs (The Skaters), a dance set on an ice skating rink on Christmas Eve. La Boutique Fantasque or The Magic Toy Shop confirms every child’s suspicion: Toys can talk and have lives of their own the second humans turn their back. Put on by Ballet Theatre San Luis Obispo, La Boutique Fantasque is about a toymaker’s wonderful creations. Unknown to the toymaker, the dolls have a secret life apart from the daily, shopping customers. When several dolls are purchased, the group rallies to stop the separation. Attendees of the show will also get to take in a performance of Les Patineurs (The Skaters), a dance set to Giacomo Meyerbeer’s festive, thumping score on an ice skating rink on Christmas Eve. La Boutique Fantasque is showing Dec. 19 and 20 at Ballet Theatre San Luis Obispo’s BlackBox Theatre on South Higuera Street. Ring in December with a festive night out at the ballet! Babes in Toyland is showing Dec. 4, 5, and 6 at the Clark Center for the Performing Arts in Arroyo Grande. Tickets range from $18 to $25 and can be purchased at clarkcenter.org. 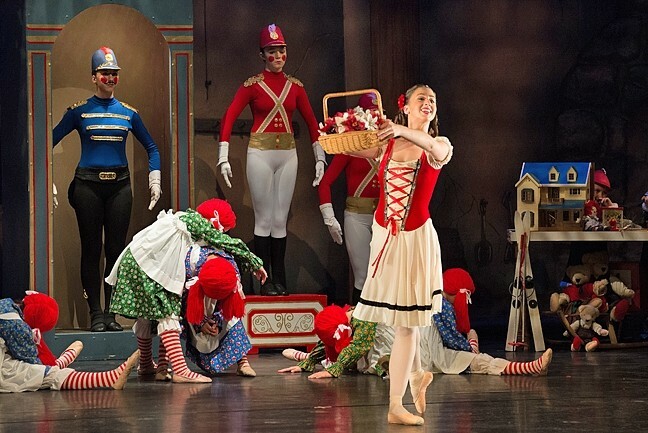 The Nutcracker is showing Dec. 11, 12, and 13 at the Cal Poly Performing Arts Center. Tickets cost $18 to $38 and can be purchased at pacslo.org. La Boutique Fantasque is showing Dec. 19 and 20 at Ballet Theatre San Luis Obispo’s own BlackBox Theatre on South Higuera Street. Tickets are $18 to $30 and can be purchased at bt-slo.org. Ryah Cooley is a Nutcracker survivor/former gingersnap at rcooley@newtimesslo.com.